How come some seemingly brilliant ideas go un-copied? I regularly read car magazines & regularly look in disgust at the rear-seat folding arrangements of popular small cars. Often, they involve tipping up the seat base, usually unveiling some extremely cost-reduced bits of sheet metal, wire & sponge. 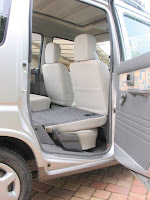 Then, after probably struggling to remove & not lose the various headrests, the seat back can be lowered to form a sloping 'floor', probably a lot higher than the neighbouring boot surface. 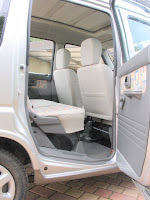 Or sometimes the seat base stays put & the back just folds on to it, leaving an even higher & more sloping floor. Yet Suzuki produced a really neat solution over a decade ago, on their extremely cheap, tiny, light & popular (in Japan) Wagon R model. OK – they didn't address the headrest bit, but that would be easy to fix. 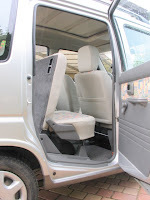 Their stroke of genius was to link the seat base to the back, so that, as you single-handedly flip the seat-back forwards, the seat base descends out of the way. The back folds perfectly flat & perfectly in line with the existing flat boot floor. Putting it all back is the same single-handed motion, in reverse. Why does anybody do anything else?